Chief Minister Vijay Rupani, who was also present the venue, said the state government would help Dr Patel multiply his achievement and work towards making it affordable and accessible to people. Cardiac surgeon Dr Tejas Patel performed what doctors claimed to be the “world’s first ever in-human telerobotic coronary intervention procedure” here on Wednesday. 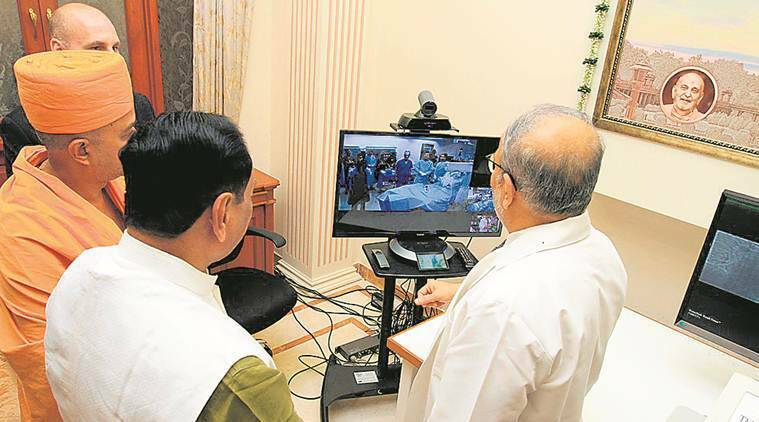 The procedure took barely 20 minutes at the Apex Heart Institute with Dr Patel supervising it from the Akshardham Swaminarayan Temple in Gandhinagar, at a distance of 32 km. The patient was in her late 50s with “90 per cent blockage in arteries”, said Dr Patel. The command centre on the premises of the Akshardham temple took a day to be readied for the procedure. Dr Patel sat alone at the command centre or ‘cockpit’, assisted by a technician and Dr Sanjay Shah, a cardiologist at the Apex Heart Institute who has worked with Patel for 22 years. The procedure called “telestenting” took barely 20 minutes, with doctors claiming it to be the world’s first such percutaneous coronary intervention (PCI) conducted from a remote location outside of the catheterization lab. The robotic system was placed in the operation theatre and Dr Patel was connected to it through high-speed wireless internet. Moving the buttons from the temple, the patient’s arteries were cleaned up and a stent was inserted. “The clearing of the blockages took barely 5-10 minutes, as I manoeuvred the robotic system (from Akshardham temple),” said Dr Patel. “We have not charged anything from her out of love and affection,” said Dr Patel. The cost of treatment was not revealed. Dr Patel, who is chairman and Chief Interventional Cardiologist of the Apex Heart Institute, used CorPath technology for the procedure. “This is the world’s first percutaneous coronary intervention (PCI) conducted from a remote location outside of the catheterization lab,” said a joint release from the Bochasanwasi Akshar Purushottam Swaminarayan (BAPS) Temple, Apex Institute and Corindus Vascular Robotics. Dr Patel said his long emotional attachment with late Pramukhswami Maharaj was the reason for choosing Akshardham Temple as the venue for performing the procedure. Dr Bhupesh Shah, an interventional cardiologist and head of the cardiology department at Ahmedabad Municipal Corporation-run VS hospital, said it is a good start. “Initially the cost may be high but over time its acceptance will increase with more units coming up,” he said. Mark Toland, professor and CEO of Corindus Vascular Robotics, said, “Existing barriers to care and growing poverty levels world over, only a fraction of patients had access to specialised and timely medical care and life-saving treatment”. According to a 2017 issue of the journal EuroIntervention, observational studies using remote PCI were performed at the Frederik Meijer Heart and Vascular Institute in the US using Corpath systems in 2015. However, the distance between the patient and the cockpit was only approximately 55 feet.